What strikes you first about this CD is the beautiful artwork. Nice pictures of Elvis in true color in front and on the back. Inside there are two pictures of Elvis just seconds before this concert. The cover says that this CD contains the entire concert from Mobile. I wonder, do these people think that we are stupid or what. It is definitely not the complete concert, and that is very easy to point out (...she is louder than I am, but I got the microphone.). 'Also Sprach Zarathustra' - 'See See Rider' and 'I Got A Woman' are from Steamroller Blues (Fort Baxter), though the sound is mixed quit a lot (to the better I think). Rock Legends lets the Mobile show start half through in 'Amen'. This edit is not one of the best I have heard, the rhythm pattern of 'Amen' is broken, but it is ok. What bothers me, though, is that they have edited the Memphis concert too. And this is utterly pathetic. Elvis has just finished 'See See Rider' before he (on this CD) starts with 'Well, Well...' - 'I Got A Woman'. Rock Legends have given us some quality-bootlegs during the last two years. Night Fever in Vegas, Hello Memphis and especially From Louisiana To Tennessee is great. On the bootleg I'll Remember You they tried to tell us that the concert is from August 15 1972, when in fact it is a concert from September 4th (The year 1972 is correct, though). Another tricky one is the bonus track on this CD. I wonder if it is from Alexandria 1977 as stated, but that is another story. The point is that Rock Legends seems to try to fool us, and that is not necessary. They will not succeed either. Stop this policy, Rock Legends! On to the concert again. 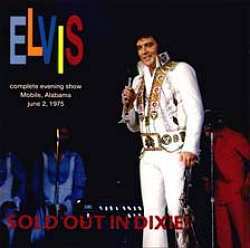 This is in general a typical Elvis in June 1975 - concert. Like the Deep Down South (King Records), Live In Dallas (From EAP Silver box), Cut 'em Down To Size (Pegasus) and finally Let Me Take You Home (DAE Anniversary) Elvis is in a very good mood. He sings well, although not as concentrate as in early Las Vegas 1975. It is a thrill listening to Elvis, because you can feel that this man is enjoying himself on stage. 'Love Me' is of standard '75 quality. Better than it would be later, but not treated with same respect as in the early 70's. 'If You Love Me' is also nice. 'Love Me Tender' is in fact better than on the aforementioned June concerts. He is of course busy with some girls during the song, but not as much as usual. Nice version! 'All Shook Up' to 'Hound Dog' is standard, although Elvis gives a little extra in the beginning of Hound Dog. 'The Wonder Of You' and 'Burning Love' is better than usual. In fact Elvis manage to remember the lyrics to the latter one. Not everyday...I only wish that this song would go along in a little less up-tempo beat. 'Bridge Over Troubled Water' is great! Man, can Elvis sing "Bridge".... This version is better than the one from June 3rd (On Deep Down South). It is a pity that the sound on this song is not as good as on the rest of the show (a lot of noise in the beginning). T-R-O-U-B-L-E' is also very good. Again, Elvis remember every word of this tongue twisting song. 'I'll Remember You' and 'Let Me Be There' is good versions. No surprises, but quality all the way. 'American Trilogy' is not performed like Elvis used to do. This version reminds of the version from June 10th (Let Me Take You Home). It is quiet clear that Elvis is tired of the "normal" version of this song, and it is not surprising that Elvis soon would take out this song of his repertoire. You really get the impression that Elvis is somewhat bored with it. Anyway, this version is not bad at all, just different. It was in fact here in Mobile, Alabama, that Elvis two years later would sing 'Trilogy' for the last time (June 2nd 1977). The concert ends with 'Funny...Little Darlin', Mystery Train' and of course 'Cant' Help Falling In Love'. All in all a very pleasant concert. The sound on this bootleg is from the deskboard, so it is good all in all. There is however a problem in the mixing. The sound "come and goes" a little bit, and also there is a lot of noise. This is annoying, due to the fact that it otherwise would have been perfect (So close, yet so far away...). It is familiar, but better than the Deep Down South concert. Much better than Live in Dallas and the 'flat' Cut 'em Down To Size, but not as well balanced as Let Me Take You Home. Another thing is that you sometimes get the impression that Rock Legends had like 2 or 3 different sources to work with, because there are splits here and there. Maybe it is only feedback (e.g. before I'll Remember You'). All in all you should buy this one. If you have one or two of the other mentioned CD's, this one offers no real surprises, but this is Elvis at his almost best! And the cover is also great!